It's going to be a moody Monday. 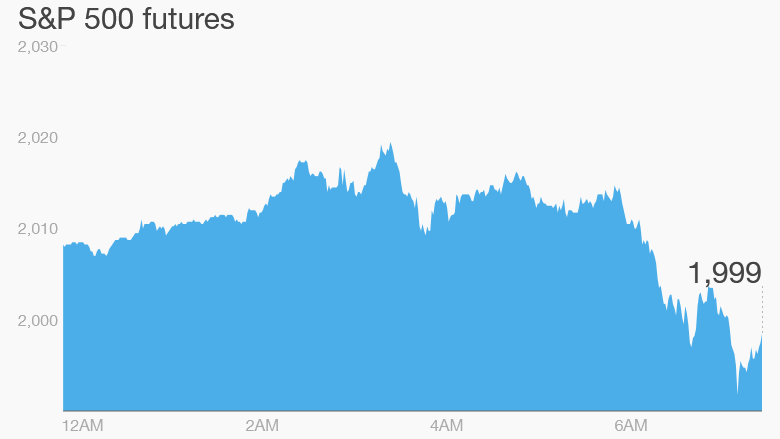 U.S. stock futures are declining again following a sharp Friday drop. And oil futures are slumping to fresh lows this morning. 1. Global market overview: Wall Street looks set for a negative start and most European markets are pushing lower in early trading. Asian markets ended with mixed results. The two main indexes in mainland China made gains of 2% to 2.5%, but the rest of Asia was in the red. The Hang Seng in Hong Kong was dragged down by Chinese conglomerate Fosun -- shares in Fosun International dropped by 9.5% and Fosun Pharmaceutical plunged 12% -- after the company announced last week that its billionaire chairman had been caught up in a government probe. 2. Oil slips: Crude oil futures are continuing their descent and are trading more than 2% weaker, below $35 per barrel. This is sure to put further pressure on shares in energy companies when the U.S. markets open. Oil prices have fallen as major producers continue to pump more barrels than the markets can soak up. 3. Yuan way? : The Chinese currency continues to trade around the weakest levels seen since 2011 after the government announced changes on Friday to how it measures the yuan's value. The People's Bank of China said it would measure the level of the yuan against a basket of currencies rather than just the U.S. dollar. The yuan is trading around 6.46 to the U.S. dollar. The currency, which is also called the renminbi, has lost about 3.5% against the dollar this year. 4. Weekly market recap: The markets were bleeding last week and suffered particularly badly on Friday. Over the course of the week the Dow Jones industrial average dipped 3.3%, the S&P 500 dropped 3.8% and the Nasdaq lost 4.1%.